Male, not more than 28 years old; At least college level; With pleasing personality; With knowledge and/or experience in bartending and cocktail mixing; Must be customer-focused. Male, not more than 40 years old; At least college level; With at least one(1) year experience in similar role. Female, 18 to 25 years old; At least 5’2” in height; With pleasing personality; At least college level; With relevant experience is an advantage; Has excellent communication skills; Must be customer service-oriented. Male, 22 to 38 years old; Must possess at least a high school diploma; With at least 1 year experience in similar/related job; Must be physically fit; Can work under pressure. 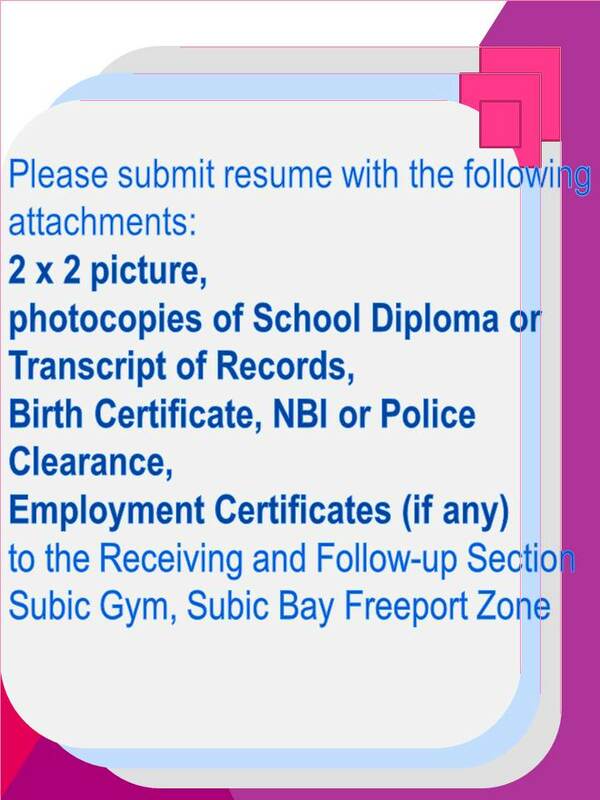 Candidate must possess a bachelor’s/college degree; Must be 22 to 28 years old; With at least 6 months of experience in similar/related function; With experience in HR and administrative job is an advantage; Has good communication skills; Must be physically fit; Can work under pressure. Female, 21 to 25 years old; Must be a graduate of BS in Accountancy; With knowledge in government mandatory remittance reports including BIR, SSS, PHIC, HDMF, etc. is a plus. Female, 21 to 27 years old; At least 5’2” in height; Must possess an associate/bachelor’s degree in Hotel & Restaurant Management or other relevant hospitality courses; With at least 1 year experience in similar role; Must be knowledgeable in handling front office operations; Has excellent verbal and written English communication skills; Must be well-versed in MS Excel and Word; Has good guest relations skills; Must be physically and mentally fit; Must be willing to work on holidays. Female, 20 to 30 years old; At least 5’ in height; With pleasing personality; Preferably a graduate of an associate degree in Hotel & Restaurant Management or other relevant courses, or at least with high school diploma; With experience in similar role is an advantage; Has excellent customer service skills; Must be hardworking and a fast learner; Must be physically fit; Must be willing to work on extended hours. Male/Female, not more than 35 years old; Must be college graduate, preferably of BS in Marketing Management/ Business Management/ Advertising/ Communication Arts or equivalent; With strong and pleasing personality; Has good communication skills; With knowledge of business correspondence; Must be proficient with computer-based graphic design and MS Office suite. Female, not more than 25 years old; Must be a graduate of BS in Accountancy; Has excellent verbal and written communication skills; Must be proficient with MS Word and Excel; Has good interpersonal skills; Must be capable of handling multiple tasks. Female, at least 20 years old; Must possess at least a high school diploma; With experience working in a manufacturing industry; Has good working attitude and measurement skills; Must be a team player. Candidate must possess at least a high school diploma; Must be 18 to 30 years old; With experience working in a manufacturing industry; Has good working attitude; Must be a team player. Female, not more than 28 years old; At least 5’2” in height; Graduate of any 2 to 4-year courses; With at least 1 year of cashiering experience, preferably in a retail industry; Has good communication skills; Must be smart. Male/Female, 18 ;to 28 years old; At least 5’7” in height for male and 5’2” for female; At least college level; Has good communication skills; With pleasing personality. Male/Female, 21 to 27 years old; Preferably a holder of a bachelor’s/college degree or at least with vocational diploma or short-course certificate; With experience in similar role, preferably in a retail industry; Has good communication skills; Must be hardworking, trustworthy, client-focused and reliable. Entry level applicants are welcome to apply. Male/Female, 21 to 35 years old; Must possess at least a bachelor’s/college degree, preferably in Accountancy or Business Administration; With at least 3 years of experience in similar function; Has good English communication skills; Can work under limited supervision; Can start ASAP. Male/Female, 21 to 26 years old; Graduate of any Engineering courses, preferably Mechanical Engineering; With at least 2 years of experience in tool and die designing/manufacturing e.g. plastic molding/press stamping dies; Has good communication skills; Must be capable of operating design software like Pro-E/ Cimatron/ AutoCAD, etc. ; Has competent skills in MS Office suite. Male/Female, 21 to 35 years old; Must possess at least a bachelor’s degree in Mechanical/ Electronics & Communications/ Industrial Engineering or other relevant engineering courses; Can operate Instrument, Inspection and Test Equipment (IMTE); Can read technical drawings; Must be computer literate. Male, 21 to 28 years old; Graduate of any 4-year courses, preferably engineering-related; With Basic Occupational Safety and Health training certificate; Preferably with at least 2 years of experience as a Safety Officer in a manufacturing company; Has good leadership and communication skills; Must be computer literate; Has high level of coordinating skills. Female, 20 to 35 years old; Graduate of BS in Industrial Engineering, Customs Administration or other business courses; Must be proficient with MS Office applications, especially MS Excel. Male/Female, 21 to 35 years old; Must possess at least a bachelor’s degree in Mechanical/ Electronics & Communications/ Industrial Engineering or other relevant engineering courses; With knowledge and skills in production machine trouble shooting including molding bending, stamping and cutting machines; Must be computer literate. Female, 21 to 28 years old; Must be a Registered Nurse, with updated PRC license; Preferably with at least 2 years of experience as a Healthcare Practitioner/Company Nurse in a manufacturing company; With OHNAP certificate of training; Must be of good moral character; Must be computer literate; Willing to work on shifting schedule. Bakit po yung ibang nka post dito hindi naka post sa labor? Pede parin ba kmi magpasa sa labor kahit hindi naka post sa kanila?